The word "Challenge" was intentional. Below are a series of construction journal entries along the course of the project as we built Haleola'ili'ainapono. Each journal entry is listed under its relative LBC imperative. The intent is to demonstrate the process of building a living building challenge project. Note: The entries are not in chronological order. Below: Nature inspires us without the use of straight lines and edges. Biomorphic forms and patterns create spaces of prospect, refuge, mystery and risk, amounting to an architectural experience comparable to an explorative nature hike. 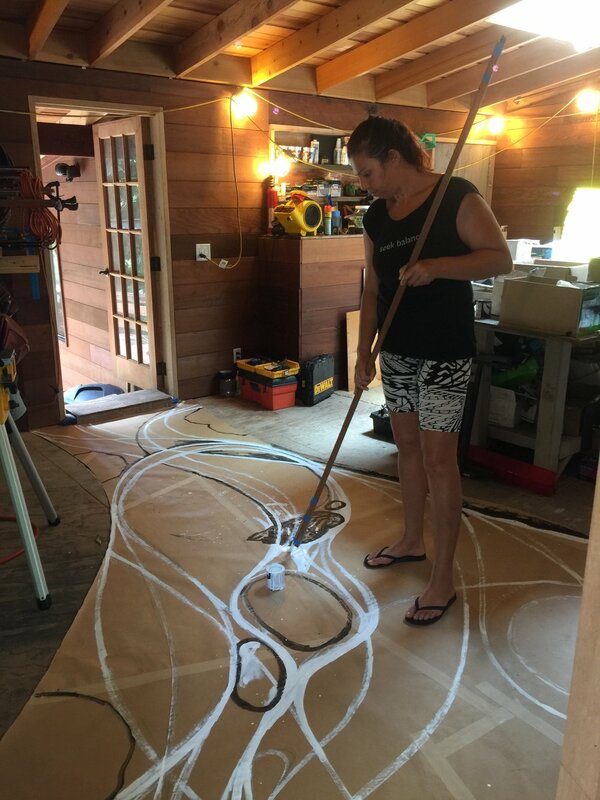 To create these smooth curves on the floor template for this piece, Maya ingeniously created herself an 8' long paintbrush. Above: Maya applies swooping lines to the floor using a custom made 8' long paintbrush. Brilliant! 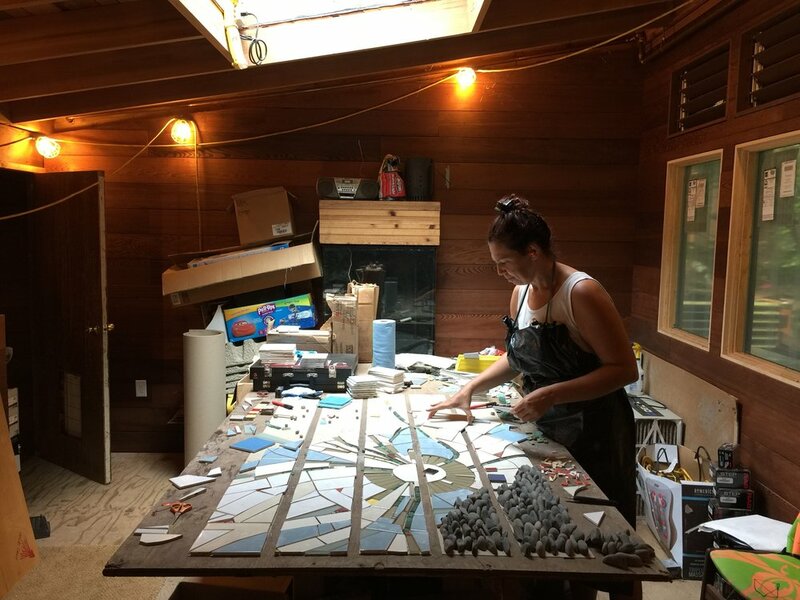 Above: Maya fills in remaining pieces of this biophilic floor mural which suggests fallen leaves and sticks strewn across a trail, cutting thru the living space. The dull flicker of flames emanating from the fire place that will be installed later where she is sitting, draw the eye to intentional sprinkles of yellow fallen across the floor. Below: This Aerobic Treatment Unit (ATU) provided by WaiponoPure LLC., recycles 100% of the building's wastewater on-site. The treated wastewater is then used to irrigate non-edible landscaping. A soil moisture monitor alerts the system when moisture levels exceed adequate absorption rates, diverting the treated wastewater into the municipal sewer pipe as a safety backup. The goal is to retain and recycle 100% of the building's waste on-site. Above: Aerobic Treatment Unit being hoisted into place with a Gradall. Net-zero wastewater is happening right here, right now. Below: Maya takes reclaimed ceramic tiles from outdated architectural sample libraries and creates biophilic elements throughout the house. This stair set mural tells a story about "seeds of change" and suggests the seeds of a dandelion being blown in the wind. The dandelion is the icon of the International Living Future Institute. This project is a seed that landed in Palolo Valley and will inspire other projects to take action. Above: Dandelion stair set being assembled by Maya. Above: the dandelion stair set is applied to the risers. Below: Keyan from American Sheet Metal (ASM) solders on the last piece of copper coping on the observatory roof deck. Views can be captured of the vegetated roof gardens below as well as all the other net-zero systems on the site. Waikiki skyline is seen at the foot of the valley in the distance. Above: Not a bad view from this office. Below: Building lava rock walls and stairs require a lot of rocks. Fortunately the property is covered in them so we collected loads of rock to build with. Salvaged concrete rubble from construction sites can serve as great filler and preserves your rock stash to be used exclusively for the exposed faces. Above: Reclaimed concrete rubble is being dropped off to be used as backfill for the new fire access stair. Above: Reclaimed cobblestones salvaged from old Iwalei Rd. are arranged in a fish scale pattern. Below: Bees swarm a bee box mounted on the roof about 5 feet over my shoulder. These pollinators will contribute to the productivity of our Urban Agriculture plan for the property. Above: Apparently the bees are a fan of the Living Buildings too. Below: These reclaimed redwood boards were denailed, scraped, planed, sanded and sealed 3 times with a red-list free non-toxic natural wood seal made of tongue oil and linseed. The product is zero-VOC which means it does not release volatile organic compounds which are harmful if inhaled. This product can be applied and installed in an occupied space without a worry about the affects it will have on your keiki. Above: Sealed reclaimed redwood panels dry overnight in the wood shop.